Haiti Relief Effort. Theo bars to support CARE. 100% of the purchase price of our 45% Classic milk and 70% Classic dark chocolate bars will go to CARE, a humanitarian nonprofit with more than 50 years of experience in Haiti, providing relief services to help save lives. 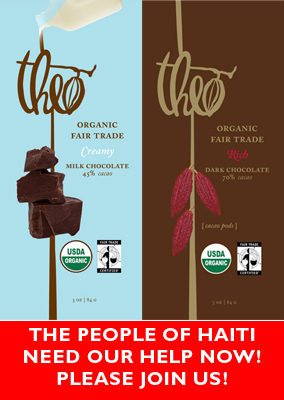 You can purchase these bars on our website www.theochocolate.com or at our factory store. *Our coffee partner Caffé Vita will begin selling the Haiti Fund bars on Thursday Jan. 21st in all six café locations in Seattle/Olympia. You can learn more about Care here.